Great news for families, Legoland have released their 2018 prices for short breaks staying a this famous resort. By booking early you are guaranteed to get the best choice of availability and their lowest prices starting from just £41 per person. Also you will pleased to hear, not only do you get to stay overnight stay at either the LEGOLAND Hotel, LEGOLAND Castle Hotel or nearby partner Hotel but you also get a delicious breakfast and 2 days for the price of 1 tickets to the resort. To guarantee the best availability for your leogland 2018 break book your break in advance! Simply visit the Legoland Holidays website to get first pick of all their great short break prices. Plus KIDs go FREE for a limited time only! 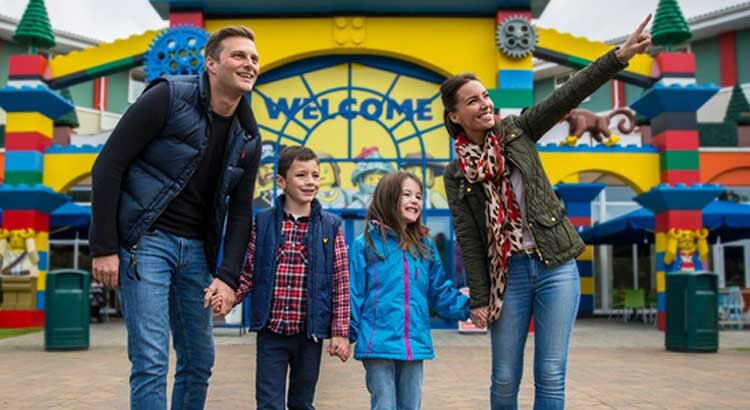 Be ready for a host of family entertainment bursting with fun attractions and rides in at Legoland in 2018, as Legoland offers the perfect break away with half term holidays also included! To get the best deal available of just £41pp for a family of four, stay in a local recommended hotel Holiday Inn Reading located 6 miles away from the resort. ! You also get breakfast and tickets for 2 days entry per person. So plenty of time to explore the resort. Alternatively you can stay on resort at the Legoland Hotel from £69pp. This Lego themed hotel is the perfect place for you and your family to continue the fun after a day in the Park. With many interactive features included in your room that both kids and adults will love. With every LEGOLAND Holiday, you receive 2 Days For 1 entry into the park per person. This means you have double the time to explore for half the cost! With so much to see and do in the resort, you will certainly need another day to enjoy all that this fantastic family attraction has to offer! This place really is the best family experience, packed with over 55 amazing rides and attractions that are perfect for keeping the kids entertained, and there’s something for absolutely everyone to enjoy during your stay. It’s safe to say that Legoland is set to be bigger and more exciting than ever before with some exciting attractions featuring at the Park, in fact there’s so much to see and do that you won’t want to miss thing. If you want to see more great Legoland holiday offers, make sure you visit our special Legoland Offers page for all their latest promotions and discounts.